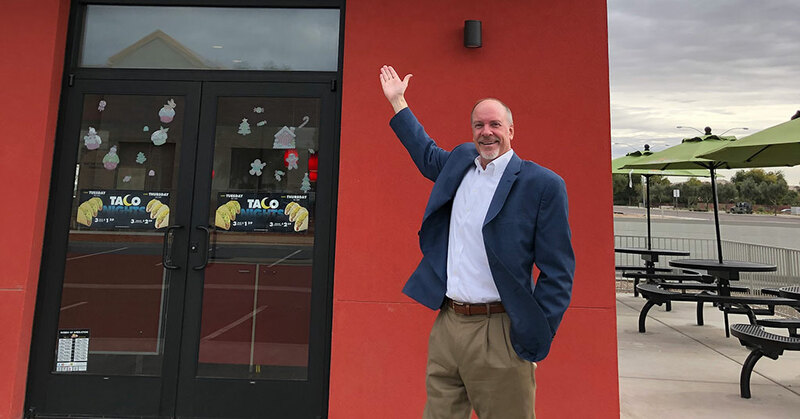 When long-time Del Taco franchisee Brent Veach was ready to roll out an official corporate vision, crafted in response to growth, he took his team go-kart racing to illustrate the new direction. After everyone took to the track for three heats, Veach declared the winner was not the driver who posted the fastest time, but rather the person whose time improved the most. "That is what we are about: continuous improvement," he says. His relentless focus on achieving results, coupled with a servant leader approach, has made Veach the largest Del Taco franchisee. He operates 50 quick-serve restaurants, 21 in Colorado and 29 in Arizona. 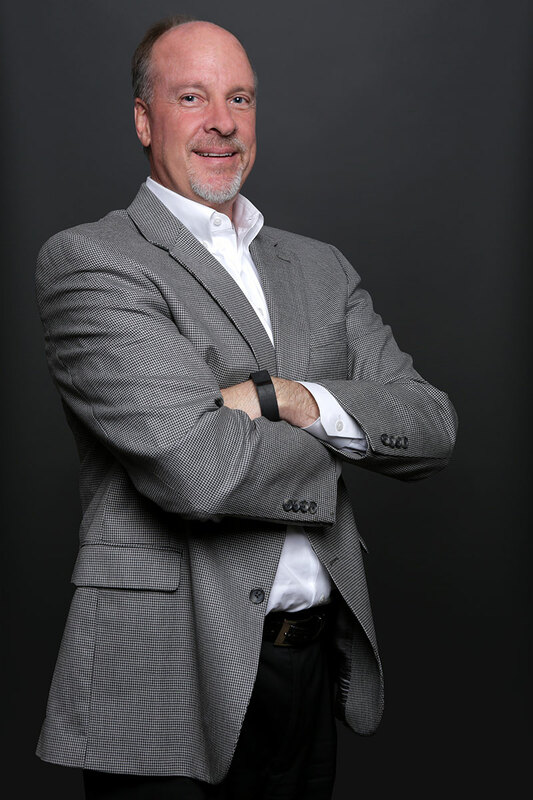 A CPA, Veach left the corporate world for franchising in 1999, initially investing in three Del Taco locations in Phoenix. "I loved the product and, at the time, thought the company was large enough to be a strong regional player and small enough for me to come in and make a meaningful impact," he says. "I thought if I could get to three to five stores it would make a nice little business." Veach has been making a meaningful impact in franchising ever since. After 20 years, he remains a steadfast champion of the brand and its leadership, serving as president of Del Taco's Franchise Marketing Advisory Team for so long he can't keep track. "I keep telling people it's been 10 years," says Veach, good-naturedly. "But it has probably been about 13 or 14 years I've been president." As he grew, Veach's hands-on approach to managing operations had to evolve with each acquisition. When his restaurant count jumped from 14 to 20 in 2012, he knew he needed to find another way to touch each store, every day. "I realized at that point, if my desire was that these stores would be a representation of me, I needed to work on the culture. Culture is so critically important," he says. So is explaining the organization's core values "and putting them right in front of people," he adds. Veach's business philosophy, shared that day at the go-kart track, has also transformed over the years. The company recently introduced the acronym SERVE (Strive for excellence, Elevate others, Relentless focus on achieving results through continuous improvement, Visionary leadership, Every guest matters) and the motto "SERVE with Pride," as constant reminders of these core values. No matter how you say it, Veach continually strives to create a culture of people, operations, and profits--in that order. "If you nail the people side and nail the operations, the profits side is much easier," he says. "And that is hard for a CPA to say." His decision to invest in his leaders with a profit-sharing plan has also paid off, resulting in the payout of what he described as "some pretty big checks," and three consecutive years of 5 percent or greater sales, driven by transactions, with many of his stores achieving record numbers. While he won't rule out ever investing in another franchise, Veach remains bullish on Del Taco and his future with the brand. "My philosophy is that healthy businesses will continue to grow," he says. "I want to continue to grow. I think that is a real positive sign, a sign of strength internally and externally. I'm positioning us for that, and I would like it to be with Del Taco." My first summer job was in Minnesota working as a semi-truck tire repairman at my Dad's trucking company. After moving to Arizona, I had a second summer job as a cantaloupe packer in a warehouse. I was paid by the box of fruit packed. This taught me a lot about how time and motion can have an impact on profitability, namely my paycheck. I would give credit to two major things: 1) my upbringing of faith and strong family values instilled and modeled for me by my parents, and 2) attending college at Baylor University, which was 1,000 miles away from my home where I knew only one person. This forced me to grow up quickly. Graduating from Baylor, earning my CPA certificate, and having a great relationship with my wife and three outstanding kids. My wife and I are adjusting to life as empty nesters or "free birds." To read one book per month each year. Thirty minutes into my first real job as an entry-level auditor at a Big Eight public accounting firm in Dallas, I realized I didn't care for accounting work, but I continued for three years before moving to Arizona and working for Motorola in its semiconductor operations. This is where I developed a passion for operations and continuous improvement. Leaving my corporate America job and becoming a Del Taco franchisee. Two hard lessons come to mind: 1) trust people but verify results, and 2) there is no substitute for me reading and understanding the details of contracts and agreements. It depends on the needs of the business. I can typically be found in the restaurants Monday through Friday in meetings. I usually will spend half of Saturday completing administrative work. I try to work out three to four times a week, which involves light weight lifting and cardio, typically jogging on a treadmill. Relationships are the most important thing in life, personally and professionally. Chocolate milkshakes with hand-dipped vanilla ice cream and chocolate syrup and chocolate donuts. This is why I have to work out three to four times a week. I have several favorite books that have affected different areas of my life. Making Life Work by Bill Hybels provides insights on how to live a quality, meaningful life and helps me in my personal life. Good to Great by Jim Collins provides great insight into how sustainable, successful companies operate. Execution by Larry Bossidy and Ram Charan provides great insights into "the discipline of getting things done." "Braveheart" (Mel Gibson's "Freedom" quote). I have an identical twin brother whose name is Brett. Also, I'm a movie star. I was on the Andy Griffith show as a six-month-old baby. Being consistently late to meetings, not being attentive during meetings, and/or consistently not completing agreed-upon assignments on time. I always wanted to own my own company and lead a business. Our family takes two vacations each year: skiing at Christmas and a San Diego beach vacation in July. We typically vacation with my parents, my brother and his family, and our three kids with their families and/or friends. George W. Bush. I admire how he handled adversity while president. The vision I have for my business is: "To positively impact the lives of other people." We operate our business based upon our core values represented by the acronym SERVE: Strive for Excellence, Elevate Others, Relentless Focus on Achieving Results through Continuous Improvement, Visionary Leadership, Every Guest Matters. We use the motto "SERVE with Pride" as a constant reminder of these values. Hiring caring and motivated team members who align with our company's core values. Also, legislative requirements are becoming increasingly more challenging. This includes annual minimum wage increases and city building requirements. I believe others would describe me as professional, passionate, and positive. I am working to develop my business and team in two areas: 1) to become more scalable, which will allow us to grow, and 2) to improve our ability to execute and consistently deliver positive results in spite of challenges. I empower the ASLs to run their businesses in a way that delivers the desired results. I'm open to new ideas and encourage the team to try different methods to find a process that works best for them. I'm very close to the operations with weekly business updates and in-store operation reviews every 28 days with my ASLs and GMs. I joke that I have more offices than most people--my stores, my home, and my truck. Some of the most important things are maintaining the brand image, industry leadership, marketing support, and new product development. We are very fortunate to have excellent leadership within the Del Taco brand. The executive- and senior-level leaders listen to franchisees' input and work collaboratively with us to improve the overall brand. This approach helps inspire the entire team to innovate and strive to improve. A willingness to partner with our business to continually improve the product/service and price. We really focus on four-wall marketing by improving the guest experience when they come into the restaurant or go through the drive-thru. We want every person who comes to the restaurants to leave thinking, "Wow, that was great!" or "Wow, that was fast!" I believe increased frequency of visits by existing guests is the most affordable marketing we can buy. Social media has a big influence on business. When something positive happens it can give the stores a big push. I'm personally involved in the hiring process of all the ASLs and very close to the general manager hiring process. It doesn't take 25 great people to run a great restaurant--it takes one exceptional leader. I want to make sure we get the right leaders in the restaurants. When it comes to firing, I might be too slow. I give people a lot of opportunities and I want them to be successful. In my 20 years of owning restaurants, I've only fired two people. We have a culture of performance, and people who don't fit in tend to leave on their own. About half of my GMs have worked with me for over 10 years. We try to be very deliberate with training and retaining. We begin each of our operation review meetings with the topic of "People." My ASLs and I discuss the People Development Plan for each store every 28 days, including identifying candidates for additional training and promotions. We also address our holistic people needs: where are we today and our anticipated needs in the next 30, 60, and 90 days. I have always had a mentor to lean on, learn from, and be encouraged by. I encourage my leadership team to develop a mentoring relationship with a successful professional they admire. I believe this is a highly successful way to train and develop your own leadership skills. Watch and learn from great leaders. We don't tend to deal with problem employees for long. They usually realize they don't fit into our culture and will weed themselves out pretty quickly. Repeatedly not executing on agreed-upon commitments and not asking for help. 5 percent sales growth driven by positive transactions. Both organically in transactions, sales, and check average, and also in the number of units we own and operate. I don't have a specific number of stores I want to grow to or sales volume to achieve. Instead, our goal has always been to "grow profitably." I was once asked, "How much is enough?" After some consideration, I realized that I didn't have an answer for that question because it was the wrong question for me. As long as we can grow the business profitably and I can achieve my personal goals in life, the question for me is, "Why wouldn't we continue to grow?" One of the biggest challenges is finding qualified employees in a strong economy. For example, the Denver market is operating at an approximate 2.5 percent unemployment rate as a result of a strong economy, which makes it challenging to find qualified employees regardless of the pay rate. Yes, we've experienced positive same store sales growth for the past several years in each of our markets. Changes in the economy can affect my business in several ways. Challenging times can provide opportunity to purchase other restaurants or refinance debt at lower interest rates, while stronger economic times can provide additional cash to continue expanding. The economy also affects the operations of our business. During weak economic times we learn to operate leaner, while continuing to prioritize guest service. During stronger economic times we invest in our operations to improve the guest experience. There are a lot of good options for capital. We've been fortunate to have people at local banks believe in us and our business model enough to continue to invest in us. We began by using local/regional banks then evolved to GE Capital Franchise Finance until they were sold. We then moved to a large national bank. One of the keys I've found that helps us in this area is working with lenders I can trust and who understand my business. I'm very open and transparent with my lenders and see them as a partner within the business. I've been fortunate to have worked with great people in lending banks. We've always trusted each other and worked together to make both organizations successful. I will always appreciate and be grateful to the local banks that believed in us when we started the business and had very little collateral and small cash flow. I've found that the larger my business becomes, the more important it is to have a lender that can grow with me. It is also beneficial to have a lender that understands the industry and the QSR segment so they can relate to the highs and lows we experience. We offer a variety of incentives to help make our top-performing employees more successful. Some of the incentives include a 401(k) plan with up to a 3 percent contribution matching. We offer a quarterly profit-sharing plan where GMs and above can earn up to 20 percent of the improved profitability of their business. We also offer a family scholarship plan of up to $8,000 for the GMs and higher and direct members of their families who attend a qualifying college. I believe we have to grow our business to success--we can't cut our way to success. The most effective way to overcome higher labor costs is to grow our sales. We have also revisited our staffing and scheduling needs down to every 15-minute increment throughout the day. This is having a significant benefit to our business. The end result is a better distribution of employee hours based on the business demand, resulting in better guest service and lower labor costs. The quarterly profit-sharing plan is a big incentive for GMs and higher. We encourage our leaders to run their business as if they were the owners, because they really are the owners of a portion of the improved profitability. It's a win-win for the leaders and the business. After 20 years of franchising with Del Taco restaurants, I am still excited and energized by my work. I enjoy the people I work with, what I do, and I look forward to continuing to grow and expand the business. I'm not ready to exit, so this is a challenging question for me to answer. I have three kids I would enjoy working with if they have a passion for this business. When the day does come that I exit this business, I want to ensure that my successor shares my passion for the success of our team members and our guests.